Desired solid level to impart strength, stiffness and burst resistance. • It is always advantageous to prepare the pasting gum solution required for a day’s work only. • Mixer & storage drums are to be cleaned regularly to get a better quality of pasting gum solution. • While preparing the gum solution, to water and not water to gum powder to avoid lump formation. Viscosity of pasting gum (in B4 cup) 35 to 45 sec. Shyam Enterprises is one of the leading manufacturers and exporters of premium quality paper adhesive, dextrin and modified starch to be widely used in various industries like textiles, foundries, fireworks & corrugated box industry etc. We are manufacturer of modified starches based in Jaipur, Rajasthan.Our plant is automatic and have largest capacity of production in North India. We export Yellow Dextrin to various countries like Russia, Turkey etc. Our white dextrin is very popular in textile industries. Our products are approved in various MNC's and Govt companies. Shyam Enterprises was established in Industrial area in Jaipur in 2003. Our promoters are alumnus of IIT and Nirma Institute of Technology. We take pride in our high quality of our products and business practices. Together they have experiences of over 50 Years in starch industry. We are based out of Jaipur, Rajasthan. Our location gives us advantage to serve commercially important regions like NCR, Punjab, MP, Bhiwadi and even North Gujarat. Our plant has state of art machines for production of even dark brown dextrin of high quality with lowest impurities. Along with automatic plant of dextrins, we also have complete range of pregelatanized starch by extrusion. Extruded pregel starch is very useful in wide range of industries like agarbatti, mosquito coil, oil drilling and corrugation industries. We have pregel starch with high solubility and density ratio which makes it excellent for export purposes. Our products are made from Maize starch and Tapicoa starch. We also manufacture from potato starch if requirement comes from customer. With out innovative products we are able to cater wide range of industries like fire works and paper industry. Our specially manufactured gum for atom bombs and air fire are very popular in leading manufacturers. We also draw our strength from paper industry where we supply corrugation gum powder, pasting gum powder, gum powder for paper tubes and cones. Our corrugation gum powder is both caustic based and neutral based. We customized our gums for various ratios as per specification like 1:10 to 1:3. Our most popular selling gum is corrugation gum of 1:6 which gives combination of quick drying and super strength to corrugation boxes. We also supply ready to mix powder for automatic corrugation plants accross India. Even our pasting gum powder is of export quality and is used widely in manual and semi automatic plants. 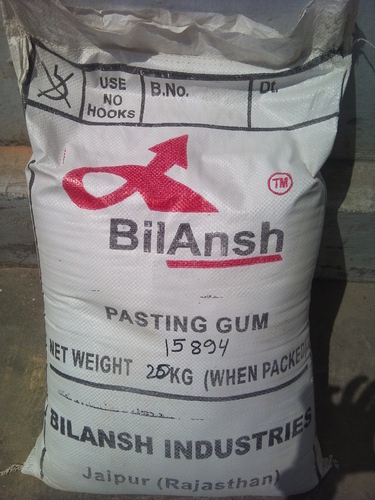 We are one of leading manufacturer of neutral pasting gum powder which is labor friendly. We have extensive and wide range of distribution channel for catering even small requirements. We are constantly looking for more active and dynamic business partners to extend our range further.